We are open again from 2nd of January 2012. 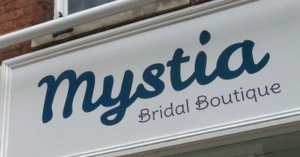 Mystia can be found on Westgate Street, One of the 4 main high streets in Gloucester that meet in a Cross. Stood at the Cross, Westgate Street entrance is flanked on the right by the HSBC bank and on the left by a gift shop. Part way down, you will see McDonalds on the right, and a little further on the left, Moss menswear. Mystia occupies the floor above Moss, so you enter Moss menswear store and go up the stairs.